Invite new users to InLoox now! You are here: InLoox Support Knowledge Base Online Help InLoox for Outlook 9.0 All support articles | InLoox 9 for Outlook Contact management | InLoox 9 for Outlook Manage InLoox users | InLoox 9 for Outlook Invite new users to InLoox now! 1. Open the InLoox now tab and click on People. The InLoox address list opens and gives an overview over all contacts. 2. 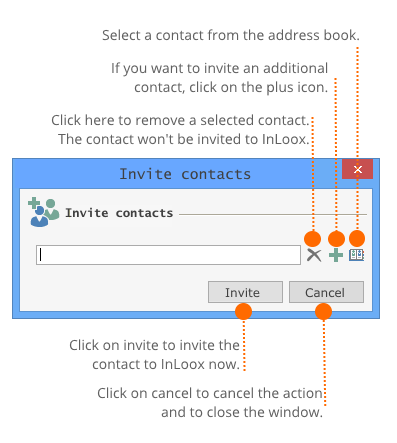 Click on Invite Contacts on the Start tab. 3. A new window for selecting the contacts will open. 4. The selected contact will receive an invitation mail for InLoox now!. Invite new users to InLoox now! • Copyright 1999-2019 © InLoox, Inc. All rights reserved.